The new iPhone 6 and iPhone 6 Plus sport large displays and because of that Apple added a dedicated feature to these devices called Reachability. With Reachability users can double tap on the Touch ID button to pull down the top section of the app so they can tap on the buttons that are difficult to reach while using their device with one hand. Reachability feature is great, however there’s one negative thing about it that users have been complaining about. When you pull down the app using Reachability there’s an awkward looking blank space that remains there until you return to the normal mode. Many people argue that Apple could have utilized this spot for something more useful for users rather than leaving it empty as it is. A new tweak called ReachWeather does exactly that by putting the current weather conditions of your city in that area. The tweak shows the weather conditions such as current temperature, level of humidity and pressure that is accessible when users activate Reachability by double tapping on the Touch ID button. After downloading the tweak all you have to do is go to the Settings app and look for tweak’s preference page. There you have to type in your city name. That’s it, after doing so you will get the weather details of your town no matter which part of the app you are currently using. 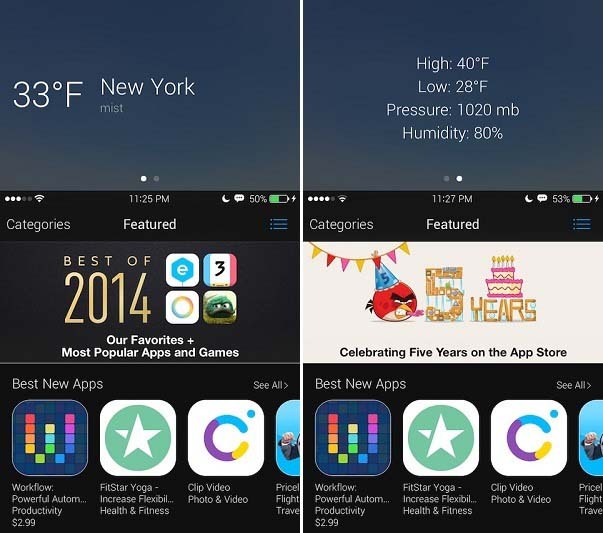 ReachWeather tweak is available in Cydia for free and works on iPhone 6 and iPhone 6 Plus.